"The best prices I found across about 20 different small and large internet retailers, and super fast, free shipping." The best prices I found across about 20 different small and large internet retailers, and super fast, free shipping. Then I got a nice letter from Steve Snell and the company, and then a survey to assess my satisfaction. Price, selection and customer service doesn't get much better than gundogsupply.com. I'm really pleased, and I'll shop again. Thank you! Just what I wanted. Easy install, looks great. I like that it's easy to clean up after our dogs go potty and it's alot more sanitary for them. Great price, quick delivery, free shipping! Absolutely awesome!! I will order from this company again!! Works beautifully in the space. I actually bought my kennel decking to cover an area that my TODDLER won't stay out of! He is far more destructive than my 200 lbs Mastiff and the decking is awesome! It has made an ugly muddy area usable and clean. My grill sits on top of it and the dogs actually like to lay on it when it is hot out too. It was so easy to put together and washes off easy. It's toddler proof! Therefore, it is heavy duty! "Excellent decking and quick delivery." Excellent decking and quick delivery. "I have used Kennel deck for over 3 years and am extremely happy in the product." I have used Kennel deck for over 3 years and am extremely happy in the product. It is quality built and is holding up great. It keeps the dogs up off the dirt/mud in the winter and seems to be much cooler in the summer. I highly recommend this product. Easy to cut and customize for size. The dogs LOVE these. Before they just had either grass or mulch to lay on. They seem to prefer to lay on these now and (knock on woods) they haven't tried to eat them yet. We use these platforms in our kennel runs. It's offers the dogs a nice place to lay off the cement. We have also placed them in some of the gravel runs. They are sturdy and easily cleaned with a hose. They are off the ground just enough to provide air and dry quickly underneath the platform. We use them everyday. We love them! "I love my Kennel Deck!" German Shepherd,Australian Shepherd. Family pet. "These are wonderful when you want to keep their furnishings clean"
These are wonderful when you want to keep their furnishings clean and free from urine. My scotties have great, long furnishings that I was always cleaning. Now I have clean furnishings thanks to Kennel Deck. Very pleased. Flexibility of configuration is great. Fits my kennel perfectly. "I really should have ordered these years ago." I really should have ordered these years ago. One small issue: I'm having trouble keeping the clips in place. The platforms are on bare ground, so the clips sort of work themselves out every now and again. Otherwise, these are great. They are easier on the dog's joints and clean up well. We'll see how durable they are, but they sure are lighter than the concrete blocks they replaced. I'm very satisfied. Good product from a great company. "I highly recommend the Kennel Deck Platforms." I highly recommend the Kennel Deck Platforms. I bought 5 to start to see if they would work out. They are easy to clean, keep the dogs dry and they love them! I have completed my kennel with the 6pack I bought from you and my dogs are really happy. I have power washed them and they are easily taken apart and moved out of the kennel for cleaning. Wow, great product! I should have bought these years ago. Does everything as promised. While installing one, it cracked. I contacted Lion Country Supply and they had the manufacturer contact me. They replaced the deck section free! FedExed to me in 2 days. "Should have bought these years ago. Great product." Should have bought these years ago. Can't say enough: easy on the dog, easy on me. A great value and much lighter than concrete blocks I've been lugging around for the past 10 years. Great product. "It is definitely not chew proof or even chew resistant!! " Labardors. Hunts. Family pet. Competes. It is definitely not chew proof or even chew resistant!! It would be better if it was made of a harder plastic. And of course a lower price would be nice too! "One standard size vs alternative sizes. space between deck and floor could be increased." One standard size vs alternative sizes. space between deck and floor could be increased. "Great for keeping dogs off the concrete kennel floor"
3 Labs 1 German Sheperd. Hunts. Family pet. Competes. Great for keeping dogs off the concrete kennel floor. Connectors break easily when you lift them up for cleaning. The tabs that hold the platforms together tend to break easily. But it's a good product and we are happy with it. The deck platforms work great. I installed them on a gravel base for drainage. There was an issue with the clips that hold the platforms together. Several of the clips broke during installation, but there were extras so I had enough to complete the decking. "Big improvement over being on the concrete"
seems ok so far, dont seem as substanial as the photos.Big improvement over being on the concrete. Platforms were grey when I set them up and now seemed to have changed to a grey tan from the weather after only a couple of weeks . I would probably buy more but they are fairly pricey. "Had difficulty getting some clips in, and once installed many clips just lift themselves out, making platforms uneven. Idea is good, but design needs work." Had difficulty getting some clips in, and once installed many clips just lift themselves out, making platforms uneven. Idea is good, but design needs work. The kennel decking looks impressive with the pics I've seen online but it's really not that durable. I received one broken panel in shipping which was quickly rectified by Gun Dog Supply and I've also had a second panel break after the installation. I think it is only a light plastic material. One other thing to note is that the slots for putting clips to fasten panels together are only put in to accept the panels in one direction so if you have a 10 foot long kennel you can't just run 2-4 foot sections and rotate the last 2' section 90 degrees and clip it in the slots will not line up. In hindsight, I should have gone with PVC decking boards from AZEC; they are much more durable and I believe they would more than pay for the 25% increase in cost. I put $400 into a floor for my kennel that I expect will be lucky to last 2 years....considering one panel broke in the first week with a 16 lb puppy playing on it, I'm not overly optimistic. Great for kennels, runs, dog cages, and more! Ships factory direct, usually within 2 business days. 6-Pack covers 48 sq. ft.
Kennel Deck is the perfect solution to providing a sanitary, yet comfortable surface for dogs in cages, runs, and more. 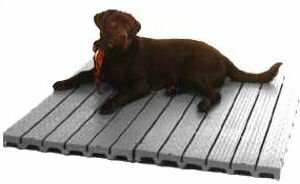 Kennel Deck's platform flooring system for pets provides a clean and proper solution for all types of dogs or other animals in a kennel or dog cage. Each platform is molded from high-density plastic resins, its unique construction allowing for easy drainage and air circulation while maintaining a flat, non-skid surface for comfort. KennelDeck is the excellent choice for raising your dog above less-desirable floorings such as dirt or concrete which can contribute to disease or bone problems. Each 2' x 4' section will fit many cages. They are easily cut with a handsaw for smaller areas, and clips are provided to extend the length or width. 8 1/2 lb. sections are 2" off the ground and are easy to lift for installation and cleaning. Each section will support in excess of 1000 lbs. and is available in a standard gray color. KennelDeck Platforms are made in the USA.